REBEL ELITE Short in black by Iron Rebel. Designed to be aesthetic, sporty and ultra comfortable to wear both in- and outside of the gym. Comes with side zipper pockets and an elastic waistband. Iron Rebel logo detailing down the side of the left leg. 60% cotton, 40% polyester. Available in sizes M-3XL. 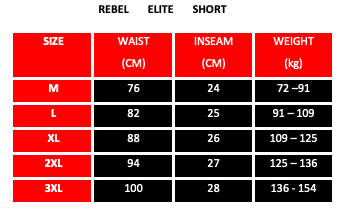 The REBEL ELITE Shorts by Iron Rebel were specifically designed to look aesthetic and sporty, and to be ultra comfortable to wear both in- and outside of the gym as well. The design offers a black base color that is pre-dominant all throughout, and dark grey Iron Rebel logo detailing down the side of the left leg. The model in the picture (Luke Carroll) is roughly 173 cm tall, weighs about 109 kg and wears a size Large. Machine wash cold. Do not dryclean. Do not tumbledry. Maximum ironing temperature 110°C 230°F. Any solvent except tetrachlorethylene. Max shrinkage 3%. Wash with similar colors. Don't iron on print.